The Sweetwater County Library, as most of you know, was built on the site of the old city cemetery. The soil at the site is of a clay-base and therefore is not a truly stable ground. To add to this, there is a small underground natural spring that runs from up the hill through the property. Last but not least, the area is on a hill which means there will always be gravity working against us. The building was opened in 1980. By 1986 the need for the first retro-fitting was arranged. 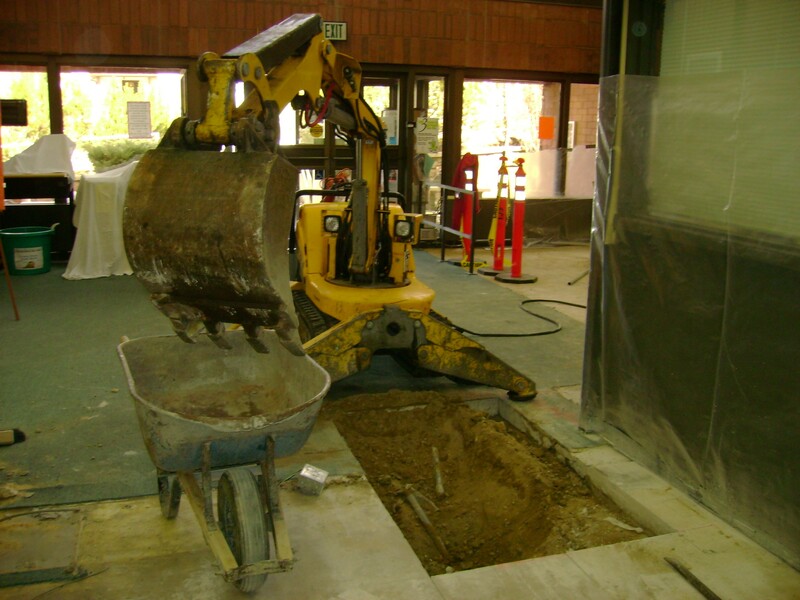 The library closed for three months while crews came in and opened the concrete flooring down to the soil. The staff told stories of noises and lights going on and off by themselves. Workers stated their tools would to missing. As a joke, several staff members placed cut-out skeletons in the holes so the workers would find them. Real bones were inevitably found to the dismay of the crews. Large holes were dug and caissons were placed in hopes the building would stabilize. Unfortunately, this was not to be. For the second time in 2007, retro-fitting was again performed. A crew was brought in and holes were dug. In the Multi-purpose Room four holes were dug. The dirt from the holes was piled in the center of the room. The mound reached almost to the ceiling. Later when the room was put back together, it was used as storage for most non-permanent items from the main library. The library was closed for six weeks, but staff continued to work on many projects. The duct was unbelievable. Most staff members ended up working in the Staff Lounge on the second floor because of this reason. After the library was re-opened ghostly activity definitely picked up. Many reports stated unexplained noises were heard and shadows were seen by staff and patrons alike. It was thought that through time the spirits that inhabit the library do not like change. They seem to dislike it when we move things or rearrange large amounts of books. Once again, currently, we are experiencing a shift in the building. As you look down the long stacks you can see a few slight raises in the floor. One set of stacks was leaning and had to be supported. If you are in the Multi-purpose Room sitting on one of our blue chairs, you may feel you are in a rocking chair. A few areas of the room seem to have an uneven bit of floor. When the chair is placed across it, it sits uneven. I was working at the Reference Desk on the computer. As I did I saw to the left of me a white orb, about the size of a table tennis ball. It moved from just above the computer down and disappeared into the floor. I have never had this happen before in all the time I have worked here (21 years). WOW. This was unbelievable. I just sat here looking at the spot thinking it would re-appear, but it did not. Wow. Now we wait to see how the shifting might affect the building and possibly the paranormal activity. This fall we start the Ghost Walks once again. This may be a very interesting year! You hear me rattle about the paranormal and what facts and information I do know. What gets me excited is proof. For 21 years I have gathered stories from staff and patrons alike, on their experiences here at the Sweetwater County Library. The one thing that is the hardest to get but is the “cream-of-the-crop” are ghostly photos that have been captured in the building. It does not happen often, but it does happen. I have taken hundreds and hundreds of photos and have only gotten orbs. I am a sceptic when it comes to orbs. Most can be proven to be dust or bugs. Rarely do I capture anything that I consider “the-real-deal”. I have to mention, I did however see with my own eyes for the first time ever a white glowing orb. It appeared the first week of June while I was sitting at the Reference Desk. It suddenly formed about the size of a table tennis ball. It happened so fast. It formed and then dropped straight down into the floor. I was in shock. 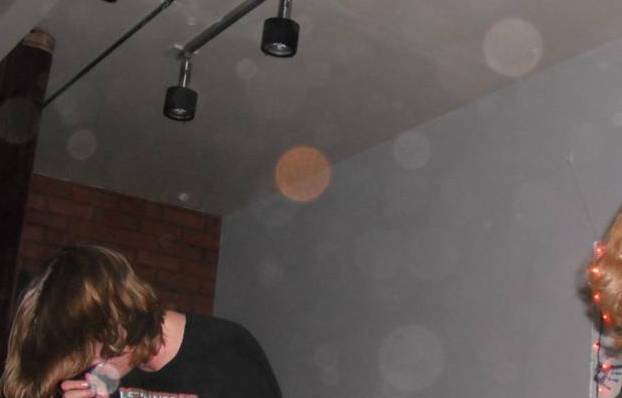 No, I did not get a photo, but I wanted to state for the record that I have actually seen a true orb. We do have one photo of an orb that is unusual. It is an orange orb. There are others around it, but it definitely stands out. It was taken during library program where a band was playing. Random photos were being taken and the orange orb was caught. During a special educational ghost walk for a local business, again random photos were taken by the attendees. 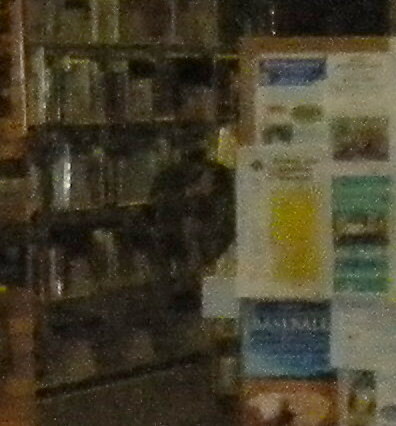 One woman was shaken when she reviewed her photos and found a dark shape in the stacks. We just call it the dark shape. To some, it looks like a small boy with his legs up as if he is sitting. Others just are not sure what they see. What do you think? One of our regular volunteers that works with the ghost walk, is Hannah. She has been a part of our group for many years and previously was part of SPIS or Sweetwater Paranormal Investigation Society. 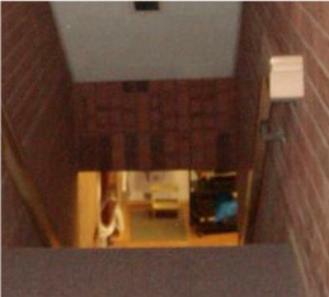 During one of the investigations here at the library, Hannah took pictures looking down from the second floor. She had noticed movement at the bottom of the stairs. She was very excited and said she had captured a photo of a blue mist. She did, but while I reviewed the photo I noticed a lady with long dark hair. I asked her who that was. She stated “What lady?” There had been no other women in the building besides her. The rest of the team were all men. Do you have photos of ghosts at the library? I am always happy to see others. Some people are shy about bringing them in to me. Please feel free. If you do not want your name mentioned, no problem. We try to gather as much information and as many photos as are available. Please remember to share your stories and your evidence whether it be photos, audio, or video. Your contributions are greatly appreciated! !